As Turkey heads to municipal elections on Sunday, the leaders of the political parties and their candidates running were in last-minute efforts on March 29 to attract votes, with a tense race expected in Turkey’s largest cities Istanbul and Ankara. President Recep Tayyip Erdoğan held his last rallies in various districts of Istanbul along with his candidate, Binali Yıldırım. They will conclude the election campaign on Saturday afternoon after holding rallies in the remaining districts of Istanbul. “Istanbul, Ankara, İzmir… These cities are of course very, very important. Our people are also aware of this. There are 30 greater municipalities that are very important. The results from these cities will have an important impact on the general election results in Turkey. They make around 80 to 85 percent of all votes,” Erdoğan told reporters on March 29 in Istanbul. Erdoğan said he expected the elections will draw to a close on Sunday without a major problem, saying he hopes the polls will bring about a good outcome for Turkey. Erdoğan’s Justice and Development Party (AKP) is allied with the Nationalist Movement Party (MHP) under the People’s Alliance against the Nation Alliance by the Republican People’s Party (CHP) and the İYİ (Good) Party. Reiterating his criticism against the Nation Alliance’s that they were in cooperation with the Peoples’ Democratic Party (HDP), which he accuses of being a political wing of the illegal PKK, Erdoğan called on the voters to not “side with terrorists.” “Can they represent my Kurdish brothers? Were they the ones that served the southeast?” Erdoğan said. He stressed that he chose Yıldırım as the candidate for Istanbu because of his long expertise and knowledge of the city. In the meantime, the Nation Alliance held its last joint rally in the western province of Manisa where a joint candidate is running on behalf of the two opposition parties. CHP chair Kemal Kılıçdaroğlu and İYİ Party’s leader Meral Akşener vowed that they will win the city and will make surprises in various other constituencies. Earlier in the day, Kılıçdaroğlu attended a TV program on the FOX TV and criticized the government over a number of issues, including Erdoğan’s recent remarks on the status of Hagia Sofia. “What difference would it make to label [Hagia Sophia] as a mosque when its function will remain as a museum. [Erdoğan’s] aim is to court votes through this,” Kılıçdaroğlu said. “If the Hagia Sofia is a museum, it will remain as one. If it is a mosque, it will also remain as one. There is no point in stirring things. If [Erdoğan] is using it as a tool for the elections, it means that his rule is drawing to a close,” he added. In a televised interview last week, Erdoğan had suggested that the status of the Hagia Sophia could be converted into mosque although the ancient cathedral would continue to be used as a museum. 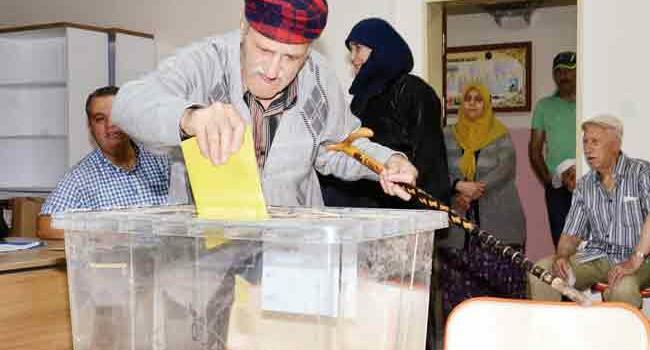 Regarding the upcoming elections, Kılıçdaroğlu urged voters to keep calm regardless of the outcome of the result. “On that night [of March 31], all of us need to display sangfroid. There can be pros or cons, or rights or wrongs. We will go to the ballot boxes and inspect each of them,” he said. The main opposition leader once again said his party will win landslide victory in the capital Ankara, Istanbul Metropolitan Municipality and the southern provinces of Antalya, Adana and Mersin. “Fighting for a certain ideal, for democracy is quite satisfying. This fight is important for all citizens. All of our rallies are like democracy festivals,” he said. “Bursa [northwestern province] can surprise us. It is actually a democratic city. It stays true to its traditions, but has left its old days behind, and now is being manipulated,” Kılıçdaroğlu added. He also stressed that he would not call for early elections even in the event of a loss in the March 31 elections. “Calling for early elections just after a party has won some provinces is political opportunism. Our mayoral candidates are making commitments and will continue their duties when they succeed,” he said.